2 views of VIA Canadian, seen same day eastbound. ...and the video, with train sounds. 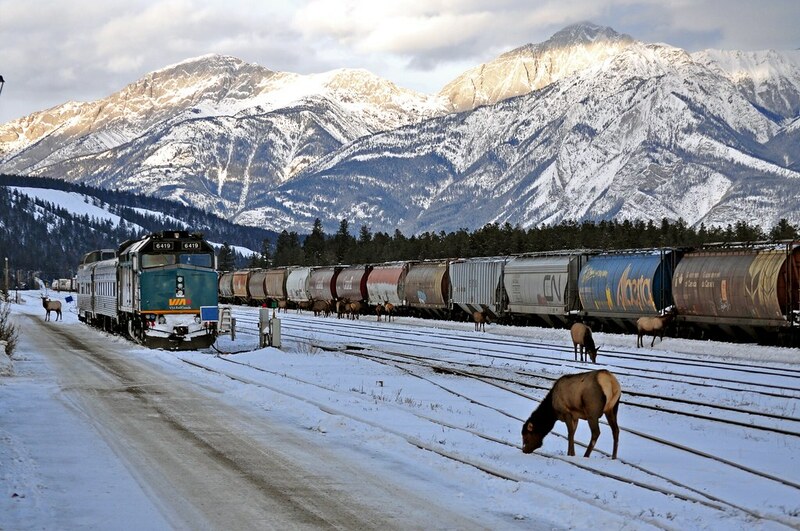 Later that day, I saw the same train leaving Jasper, AB. But that will be shown on a different video. In that video I counted three locomotives & 23 cars for a total train length of 26. That is, I think, the standard summer length of The Canadian, and about as long as a passenger train ever gets in Canada. Two days later, an Eastbound Canadian leaving Jasper had 2 locomotives and 21 cars, for a total of 23. This was September 10, 2014. Excellent pictures and videos. You also managed to capture a significant train as well. If you look at all the cars passing, you will see the colour stripe above the windows is blue. However, on the Park car at the rear the colour is grey. VIA sent 4 Park cars out for a two year rebuilding program as well as some of the Chateau series (the ones with the one lower one upper window arrangements rear end of the cars). They are now have a very upscale and also accessible interior, being referred to as Prestige cars and service. Your video captured the very first trip of the Canadian with such a car in service! Thanks for that info; I appreciate that level of detail of something I was oblivious to. I will eventually post a video of a different eastbound VIA consist, taken 2 days after this first one. That will give an interesting comparison in those specific cars (I've already noted that this 2nd train is 2 cars shorter than my first train). Flugel Horn: Well you did say you were interested, so here is more detail on the Canadian that your video showed!!. 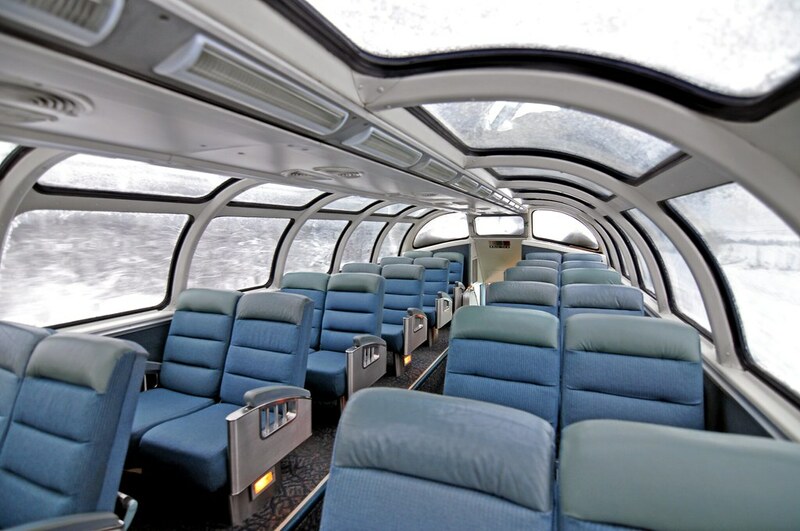 The consist of the train is as follows: 3 Units, 2 Chateau Sleepers (note the up and down window configuration on one end-both cars deadheading), baggage, 2 coaches, Skyline dome car. This is the end of the economy section of the train. From here back the train is restricted to Sleeper Class passengers and the cars are: Diner (note exhaust fan on roof line near the front), Skyline dome, 3 Manor class sleepers (all windows on the same level), Panorama car (off at Edmonton-only runs between Edmonton and Vancouver), 4 Manor sleepers, 1 Chateau sleeper, Skyline dome, diner, 3 Manors and the Park car. As the season winds down, they cut cars forward of the rear diner. In the winter the train would only have a coach or two, a Skyline, diner and then 3 sleepers and a Park car. The GM units that work the Canadian/Churchill/Prince Rupert trains are all serviced in Vancouver, any my guess is that the third unit and the 2 Chateaus would be pulled in Winnipeg to work the Churchill train. It gets busy now as "polar bear" season is soon arriving and extra sleepers will be needed. The westbound train drops it's first unit in Jasper for the Prince Rupert train and takes the one that has worked for 2 weeks down to Vancouver for servicing. A few of the GM units work in the east on the Ocean (Halifax) train. The GE units never work the Canadian nor the Ocean. In the summer it takes 4 train sets to operate the Canadian, and 3 in the winter. Now you know!! 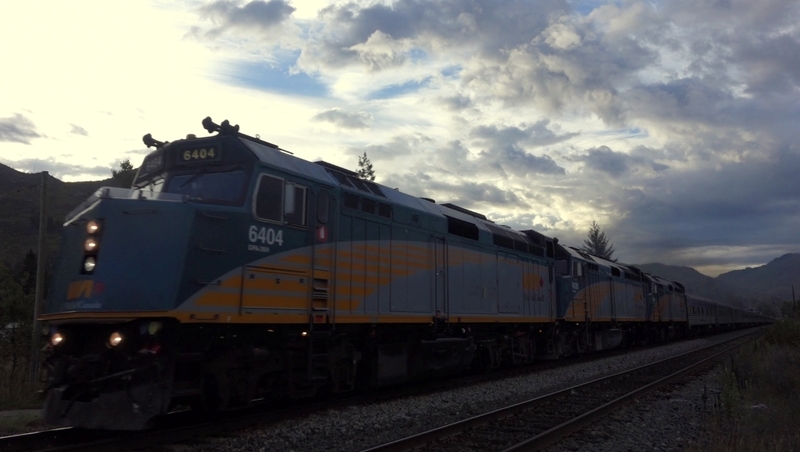 VIA Canadian leaving Jasper in evening on September 8, 2014. 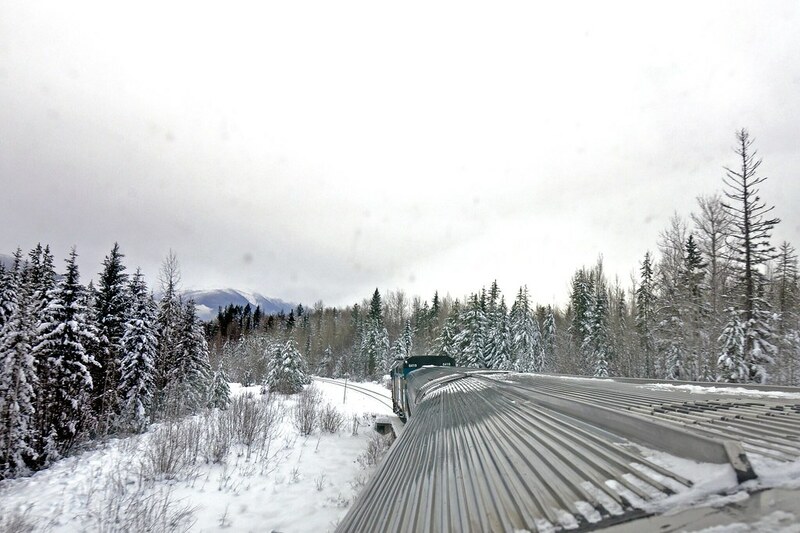 - heading eastward, this is the same train that I filmed in both Barriere and Valemount earlier that day. ...but the weather was colder, this time. I've seen the Hanjin and Cosco ships at/near Fairview. I guess they are the big players. 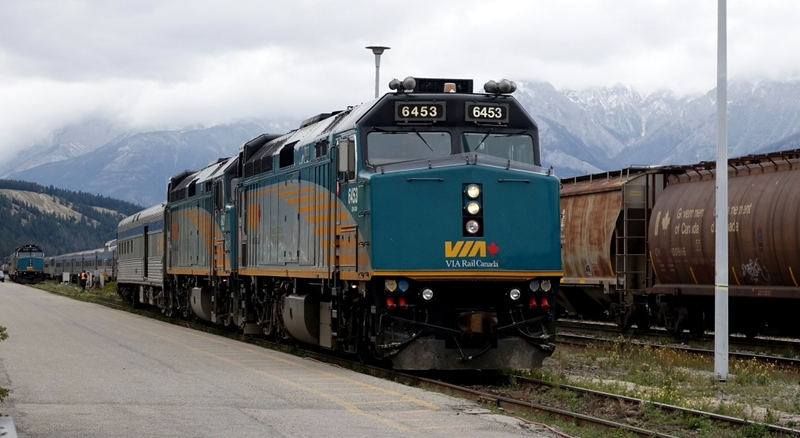 Some VIA action from Jasper train station, on September 9-10, 2014. 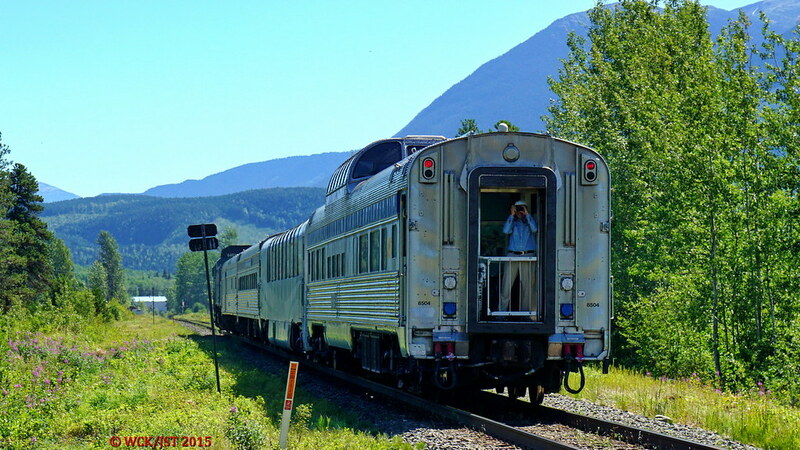 Featuring the VIA Canadian (Vancouver - Toronto) train, and the VIA Skeena train (now called "Jasper - Prince Rupert" train, but I'm still calling it the Skeena). On Tuesday Sept 9th, the Skeena was already at Jasper, sitting idle at the end of a track. It waits a few days at Jasper, and it wouldn't depart until the Wednesday. 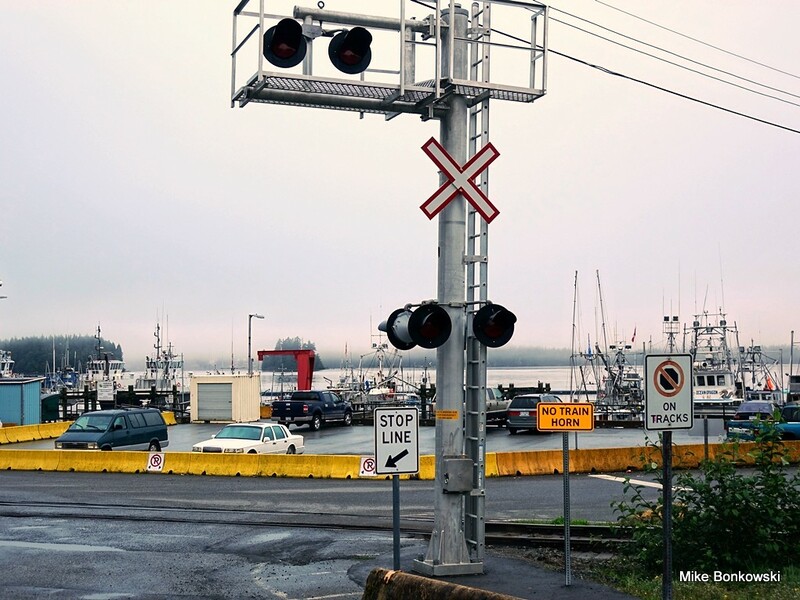 When I was at the train station, I noticed the Skeena, so I stopped to photographed it. But I was also surprised to learn that the westbound Canadian was 6 hours late, and would be arriving very soon. So I convinced Mrs. Horn to hang around the station for a bit, and we waited for VIA Canadian to arrive. 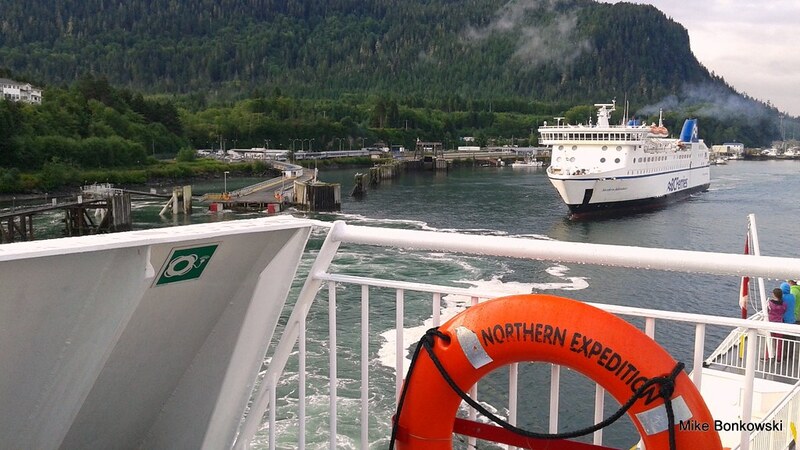 The video in this post captures that moment when Canadian arrived, while Skeena was on the side. Here's a photo of that, which I'd posted here earlier. - Skeena train in left background. On a long, linear worksite such as a train station, a bicycle is a practical way to get around. The final time that I saw a VIA train on my Jasper road-trip was on Wednesday Sept 10, 2014, in the evening near Snaring River. 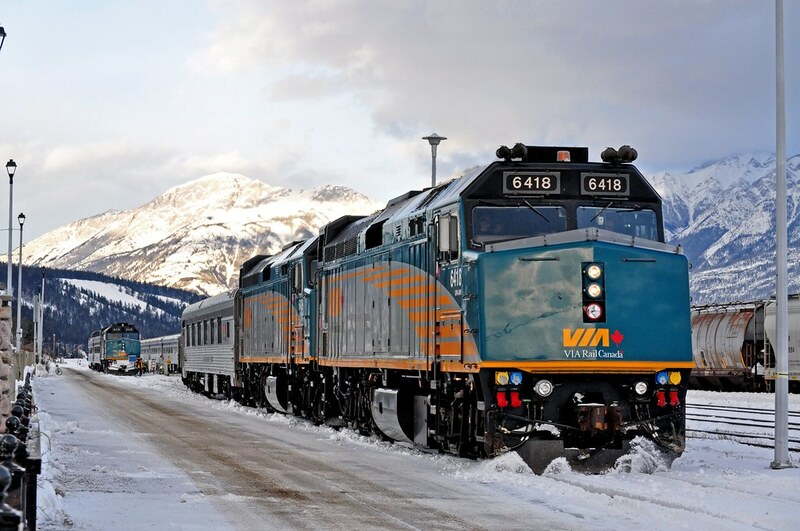 Here's the VIA Canadian eastbound, shortly after it left Jasper station. This is a nice photo location, just off the highway and a short walk over a berm. Last time I was on a Park Car was actually in the US! They were leased by Amtrak (along with some HEP1 and HEP2 coaches) for Amtrak's Adirondack. 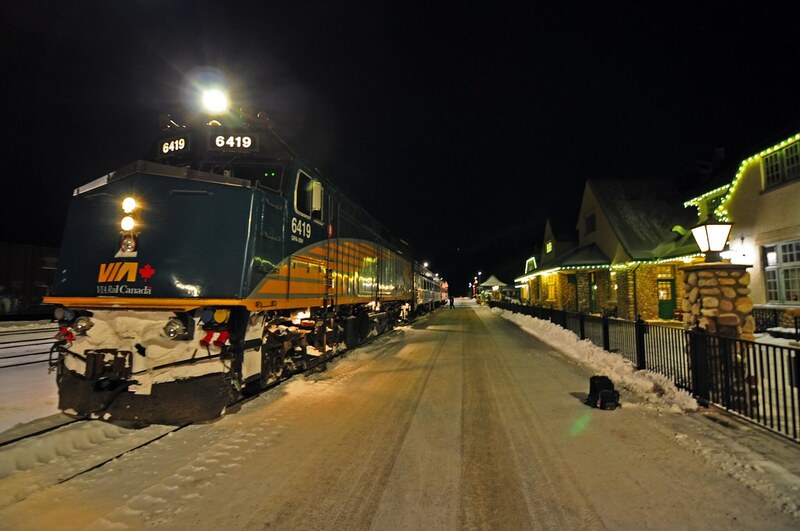 VIA Rail's Skeena in Jasper on the evening of December 1st... More photos to come, later this week from my rail travels. I have spent some quality time on VIA Rail this week, after traveling from Prince George to Jasper on the Skeena, and then from Jasper to Vancouver on the Canadian. I loved my trip, and while I am not sure I really got an accurate reading of the true scenery from the Canadian, I highly recommend the Skeena to anyone who has not yet done it (especially in winter). The first leg of my trip (Dec 1) was next-level beautiful - while Mt Robson wasn't visible, the scenery was spectacular nonetheless. Blemishes and marks in the photo are from the dirty dome car window. 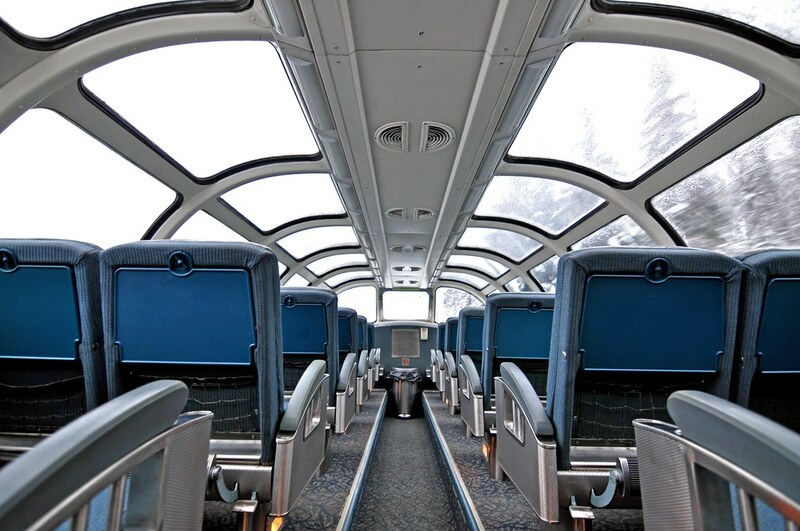 A couple pictures of the dome car of the Kokanee Park car. The next day (Dec 2), I started my overnight journey on the Canadian. 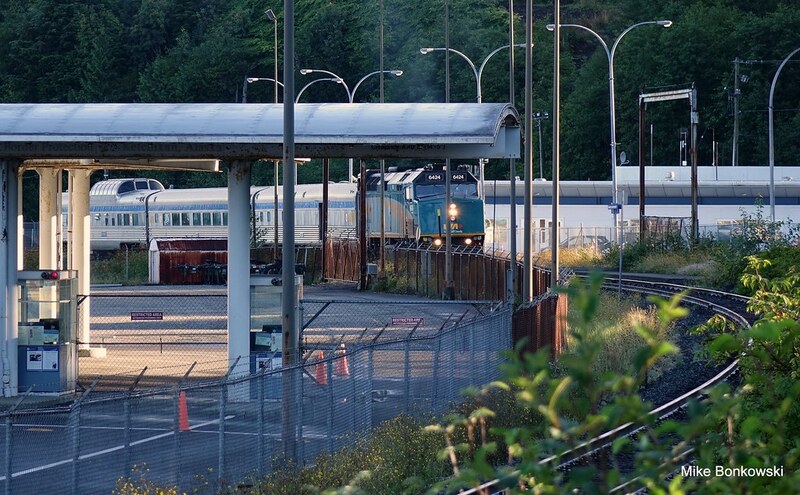 The train I had traveled on a day previous is seen idle in the background (the Skeena does not operate on Tuesdays). 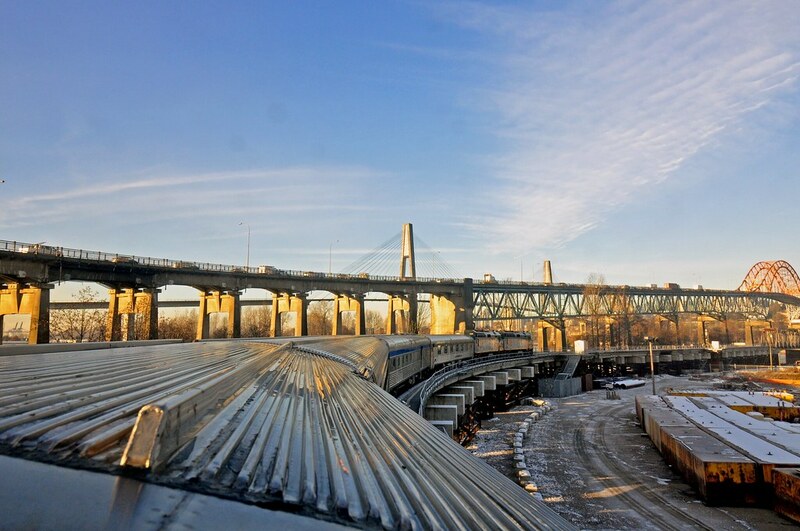 This final photo from the dome car on Day 3 (Dec 3) shows us moments from crossing the Fraser River bridge from Surrey into New Westminster. Here are two photos of Via's east bound Skeena at Moricetown, at about mile 22 of CN's Bulkley Subdivision, between Smithers & Terrace, BC. These were taken on Sunday, 11 January 2015. The bridge above the tracks carries the Trans Canada - Yellowhead Highway (#16) over the railway. The Fairview terminals area is a feast for the transpo-fan's eyes, depending on how the timing of everything matches up. 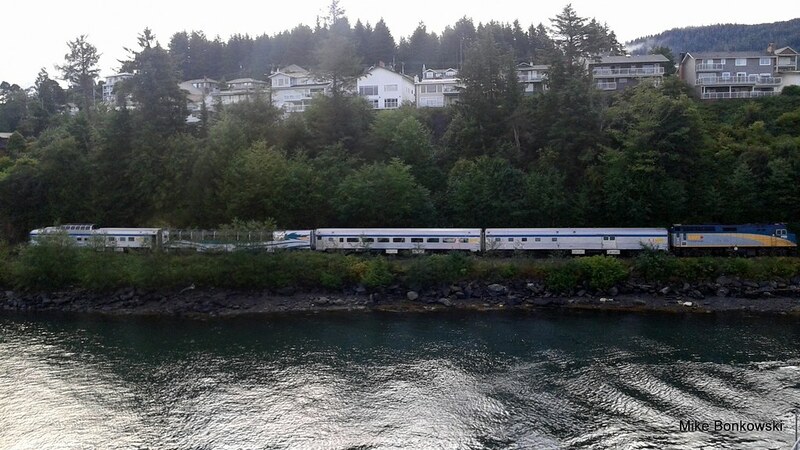 On my Wednesday morning visit, I saw 2 BC Ferries, 1 local ferry (DIF), and the VIA train. The only thing missing was a Blue-Canoe. 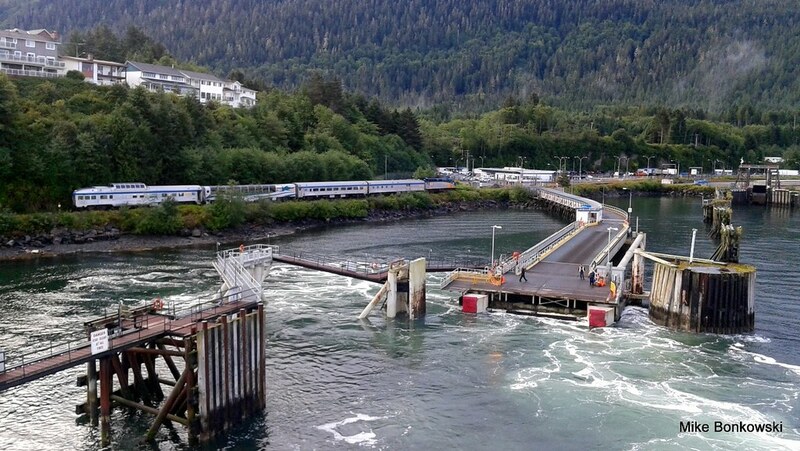 2 ferries and a train - oh my! The winter consist is even shorter! Just ask Mr. Coulson. The summer version of the Skeena, east bound at Kitwanga on CN's Bulkley Sub ... Note that they have a 'Skyline' dome bringing up the rear of this train rather than the usual 'Park' car. 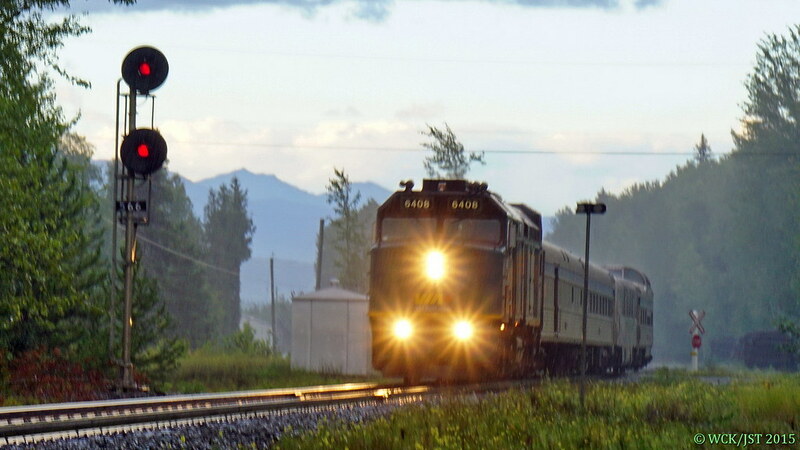 Via's west bound Skeena running more than FOUR hours late @ Carnaby (just south-west of Hazelton), mile 57, CN's BC North Main (Bulkley Subdivision) - 15 August 2015. I was not expecting to see this train as it was 8 PM on Saturday evening. This train should have been at or close to Prince Rupert by this time. As it was I doubt that it reached there until after midnight. I've heard that, this summer, the Canadian has often been more than 13 hours late by the time it reaches the end of it's journey in Vancouver or Toronto. 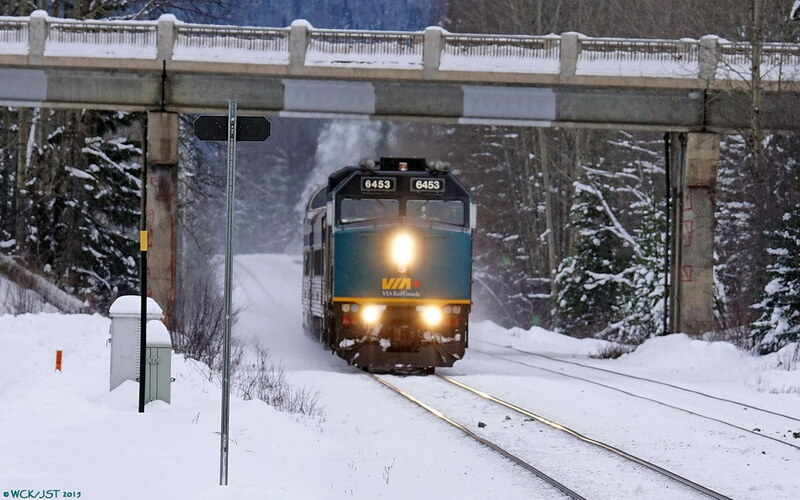 That lateness is a problem, because the train overnights in Prince George. So somehow it managed to get 4 hours behind schedule, just between Prince George and the Hazeltons. That's a lot of time spent on sidings, or maybe mechanical problems at the start of the day. Either way, it's not good. Yes, absolutely. It may have been something mechanical or otherwise an acceptable reason, but somehow, I doubt that. CN, it seems, does not care. Some of the people on that train may have been having a very early morning the next day, catching the Northern Expedition south ... An expensive trip and at times less than enjoyable. The other night, I was driving along First Avenue in Prince George at about 12:30 am, after I had dropped a friend off at her home. First Avenue runs parallel to the CNR yard (not the BCR yard) with no barrier. 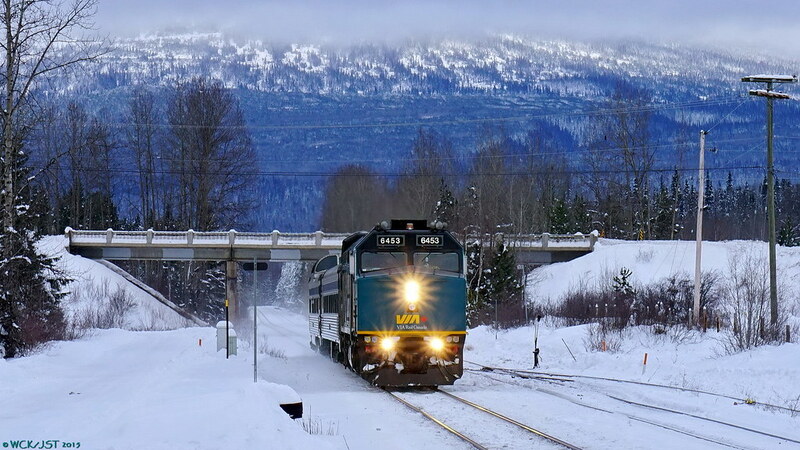 As I was driving, the Skeena came barreling the other direction down the tracks passing me into the station, about 4 hours late, as Jim mentioned with the westbound Skeena he photographed. Unfortunately, this is a reasonably common occurrence, and it has given VIA a bit of a reputation here in town. Residents enjoy riding the train when time is not an issue, but would rather use their own vehicle for a more predictable timeline, myself included. Conductors on board have told me in the past that CN receives a small fine for making VIA trains late, however their cost-benefit analysis is that they will still make more money than had they given their own services a lower priority on the rails. The end result is that the Skeena and Canadian sit on sidings for long periods of time. EDIT: It's also worth noting that, very often, the train will begin it's trip from PG late. CN has a tendency to park their freight trains on the VIA platform track overnight, and if, for whatever reason, that train has not moved (mechanical issues, bridge congestion issues, or otherwise), that VIA train becomes late. This was the case when I took the eastbound Skeena, and they actually put me in a cab and drove me out to the VIA train in the yard, since I was the sole passenger. The train left on time since their only passenger was quite enthusiastic about a taxi ride into the train yard, but had their been others, it would have most assuredly been late. 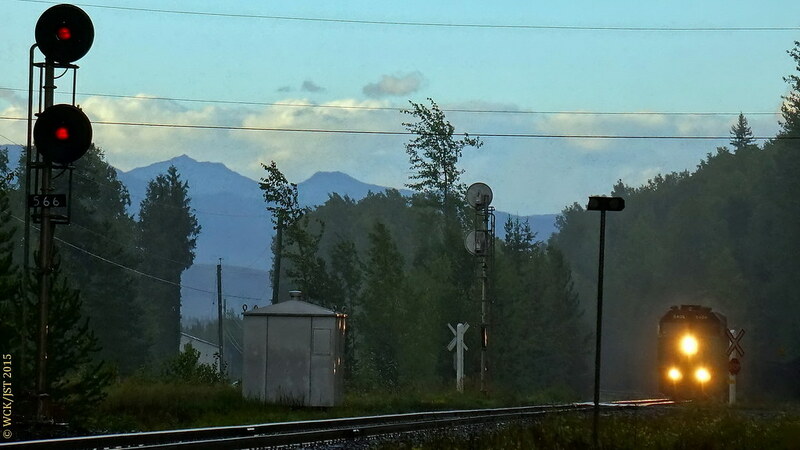 Via Rail's west bound Skeena running four hours plus late through a heavy downpour @ mile 57, CN's Bulkley Subvision near New Hazelton in north western BC - 15 August 2015.